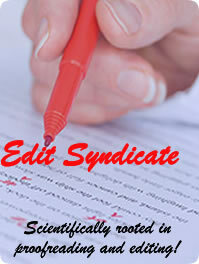 Edit Syndicate offer comprehensive manuscript proofreading and editing services. Whether you are a scientist, researcher, student, corporate manager, journal publisher, university, research group/institute, or a pharmaceutical company, we have the required editing services for your need. Edit Syndicate focuses mainly on manuscripts and books from developing and non-English Language speaking countries because non-native English speaking authors' works often suffer rejections by prestigious publishers due to poor English structure, jeopardizing their chances for career advancement and recognition within their field. We significantly improve the language and presentation of articles simply by proofreading, editing and formatting articles to meet the structure and standard of the publisher in which authors intend to publish with. Also, we (with authors' permission) insert scientific jargons (where neccessary) that appropriately convey the intended meaning of a sentence line in scientific findings and non-scientific reports. Edit Syndicate services include proofreading; editing and formatting of articles to meet the structure and standard of the journal in which authors intend publishing their articles; correction of grammar errors; deleting of redundant sentences; fixing problem sentences; replacing inappropriate words; and getting rid of obvious spelling errors; re-arranging sentences and paragraphs (if the need arises), so as to improve the overall clarity and organization of your reports while still retaining its original meaning. We specialize in providing professional editing and proofreading services for research papers, research proposals, grant applications, essay write-ups, thesis/dissertation, book editing and proofreading, proofreading of business proposals, personal statements and term papers, etc. We utilize Microsoft Word’s Track Changes feature so you can see all of the changes we make to your document. We provide you with a tracked version that highlights our changes, as well as a clean version that has all of our amendments accepted (free of any tracking). Where suitable, our editors will introduce changes to the lexis/vocabulary to improve the academic tone and style of a document. For non-academic documents, we aim to ensure that word choice is suited to the purpose and readership of the writing. Issues with logic and clarity are important areas of consideration for our editors. We will look to fix such issues that can be repaired and provide feedback and guidance on areas that need the author’s attention. We will correct issues related to improper sentence construction and awkward phrasing to ensure that your writing reads in a coherent and logic manner. Saying more with less is an important nuance of successful academic writing. Our editors will analyze your writing and make corrections to excessive wordiness, repetition, and redundancy. We will proofread your writing to correct errors related to grammar, punctuation, and spelling. We target errors such as misused articles, run-on sentences, incorrect coordinating conjunctions, comma splices, verb-subject agreement issues, dangling participles, split infinitives, and other issues. Our research scholars and writers are highly professional with many years of experience as peer reviewers and editors of some of the top international journals. They will help you in choosing the most appropriate publisher and journal for your research article, and write cover letters for you as well.